Before talking about the prophets in Islam, I would like to give you an analogy. Well, it’s kind of like a story and an analogy, but it should help explain the significance of the prophets in Islam. I remember when I first learned to drive. It was in Brooklyn, NY and I was really nervous. I’m glad I didn’t hit anything and I got my license on my first try. Fortunately I had a good teacher. Can you imagine learning to drive without a teacher? What if you were ordered to get a license but couldn’t find anyone to teach you? Do you think that would be easy? (1) Guiding humanity from the worship of created beings to the worship of their Creator, from being in a state of servitude to the creation to the freedom of worshipping their Lord. (2) Clarifying to humanity the purpose of creation: worshipping God and obeying His commands, as well as clarifying that this life is a test for each individual, a test of which its results will decide the type of life one will lead after death; a life of eternal misery or eternal bliss. There is no other definite way to find the true purpose of creation. (3) Showing humanity the right path that will lead them to Paradise and to salvation from Hellfire. (4) Establishing proof against humanity by sending prophets, so people will not have an excuse when they will be questioned on the Day of Judgment. They will not be able to claim ignorance to the purpose of their creation and life after death. (5) Uncovering the unseen ‘world’ which exists beyond the normal senses and the physical universe, such as the knowledge of God, existence of angels, and the reality of the Day of Judgment. (6) Providing human beings practical examples to lead moral, righteous, purpose-driven lives free of doubts and confusion. Innately, human beings admire fellow human beings, so the best examples of righteousness for humans to imitate are those of God’s prophets. (7) Purifying the soul from materialism, sin, and heedlessness. (8) Conveying to humanity the teachings of God, which is for their own benefit in this life and in the Hereafter. Allah has ordered us to worship Him. And in His infinite mercy, He has sent thousands of prophets as guides to help us. These prophets of Islam have been coming to man since the beginning of our existence. The first of these prophets was Adam, and the last was Prophet Mohammed, peace be upon them all. The Arabic word for prophet is Nabi. The prophets or Nabiyun (plural of prophets) acted as guides and reminders for man. They were usually sent to a specific group of people who indulged in specific sins. The prophets would encourage their people to live righteously and worship Allah alone.May Allah’s Peace and Blessings be upon them all. Sometimes the people listened to their prophets. And sometimes they didn’t. Those that didn’t were punished by Allah. Noah – He exhorted his people to stop worshipping idols and only worship Allah according to true monotheism. 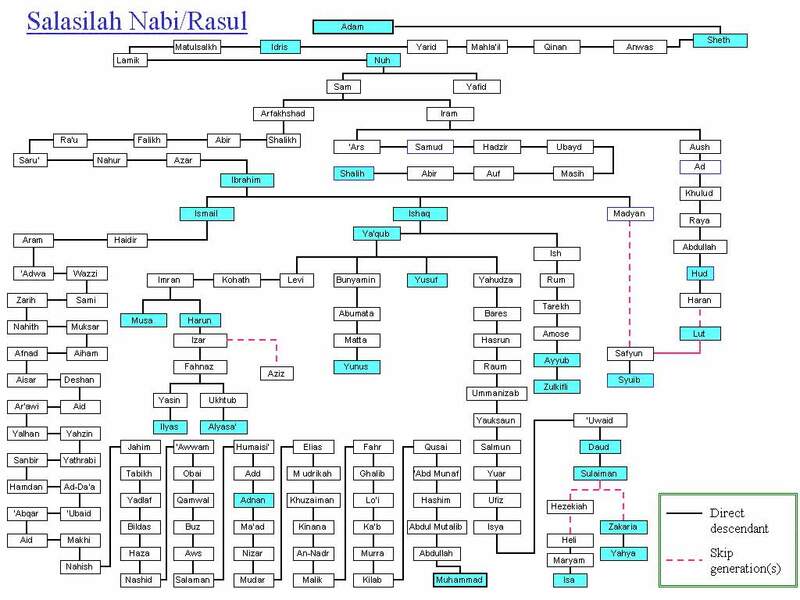 Nuh (Noah in Arabic) called his people towards Islam for nine hundred and fifty years. In all that time, only eighty people accepted his call. Even Noah’s own son rejected the truth. Allah punished them with a great flood that is still spoken of to this day in almost every civilization. Hud – He was sent to the people of Ad in what is now Yemen. Hud also tried to guide his people towards Islamic monotheism. The Ad mostly derided and insulted Hud and continued to worship idols. Allah punished them by causing a severe drought, then sending a great cloud. The Ad thought this cloud would bring rain but it only brought a mighty wind that destroyed their entire civilization. 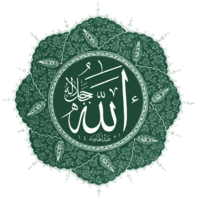 Salih – This prophet was sent to the people of Thamud who also worshipped idols. The Thamud lived in magnificent buildings hewn into the sides of mountains and hills. They refused to worship Allah unless Salih brought them a miracle. So Allah caused a huge rock to split and brought a she-camel out of it. Most of the Thamud still disbelieved so they were punished with a series of violent earthquakes. Lut – The people of Sodom and Gomorrah practiced homosexuality openly and in secret. The Prophet Lut (Lot in English) was sent to them to warn them of the punishment of Allah. Lut encouraged them to repent for their sins and worship Allah alone. When they refused, Allah sent two angels to warn Lut of the pending destruction. Lot and his family (except his wife who was not a believer) fled the town. Allah sent a storm of stones and earthquakes. The entire city was destroyed. Today, the town is beneath the Dead Sea in Palestine and nothing can live or grow there. Shuaib – Shuaib was sent to the people of Midian. The Midianites were excellent tradesmen but resorted to cheating and lying about their wares. They were also bandits who would rob travelers on the roads. Shuaib tried to guide them towards Islamic monotheism but they refused. When Allah decreed their punishment, Shuaib and his few followers fled the city. Allah sent a mighty blast that flattened all of Midian killing everyone and leaving them in a prostrating position. Musa – Moses was sent to his people the Israelites, who were enslaved to the Egyptians at that time. Musa and his brother Haroon (Aaron) had a mission to guide the Pharaoh of Egypt towards Islam, and encourage him to free the Israelites. Pharaoh, believing he was a god, refused on both counts. Allah sent several punishments to the Egyptians including drought, flooding, locusts, frogs and lice.When it became apparent that Pharaoh would not relent, Musa and the Israelites fled Egypt in the middle of the night. When Pharaoh found out his slaves were running away, he led an army in pursuit. The Israelites stopped in front of a sea that could not be crossed. Allah caused the sea to split apart and Moses and his people crossed on dry land. When Pharaoh saw this he tried to cross also. 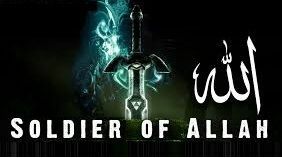 But when his army reached the middle of the sea, Allah brought the waters together, drowning them all.When Pharaoh saw that his death was imminent, he said: “I believe in the God of Musa.” But it was too late by then. He will be in one of the deepest levels of Hell. In Islam, there is a difference between a prophet and a messenger. All of the messengers of Allah were prophets. But not all of the prophets were messengers. The Arabic word for messenger is Rasul. The prophets were sent to their people to teach them and judge them according to a previous law or message. The messengers were prophets that were sent with a new message and law, generally to a disbelieving people. Therefore, prophets like Dawood (David) and Sulaiman (Solomon), were sent to judge their people according to the law sent to Moses. They were prophets, but not messengers. However, Musa (Moses) brought a new law (The Tawrat), so he was a messenger. Isa (Jesus) also brought a new law (Injeel) so he was a messenger and prophet also. And Prophet Mohammad (SAW) brought the Quran, so he was a messenger and prophet as well. However, it should be noted that according to some Islamic scholars, there have been over 240000 prophets in Islam. Muslims beliefs require belief in all of the prophets and messengers. 4) Qur'an (Koran) To Prophet Muhammad Mustafa (صلی اللہ علیہ وسلم). The commandments of Allah are contained in these books. The first three books were for the earlier times. The Holy Qur'an is the last book of Allah and is for the guidance of entire mankind till the Day of Judgement. Today, there have been 99 visitors (188 hits) on this page!